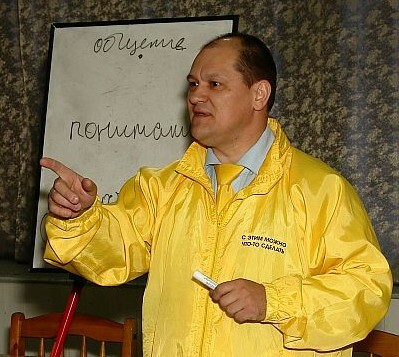 Scientology Volunteer Ministers Trans-Siberian Tour members deliver workshops on the many subjects covered in the Scientology Handbook, including how to cope with problems at work, how to improve relationships, raise happy children and achieve one’s goals in life. The Scientology Volunteer Ministers Trans-Siberian Goodwill Tour has completed it’s stay in Ulan-Ude, the capital of the Buryat Republic in south-central Siberia. For several months the tour has been providing workshops, seminars and one-on-one help in the region as part of its work to widely restore purpose, truth and spiritual values to everyday living. One workshop on Study Technology presented to secondary school teachers and was deemed of wide value to the community and not only for the classroom. Covering fundamental laws on learning researched and discovered by L. Ron Hubbard who also developed effective methods of study, one teacher remarked on how it applied to her students ability to perform music. Another teacher said the information would improve her students performance and that she was grateful it was being made broadly accessible through the work of the Goodwill Tour. The Trans-Siberian Goodwill Tour is one of ten Volunteer Minister Goodwill Tours dedicated to helping people in remote areas spread trust, decency and tolerance in their communities. For more information visit the Scientology Volunteer Ministers web site. 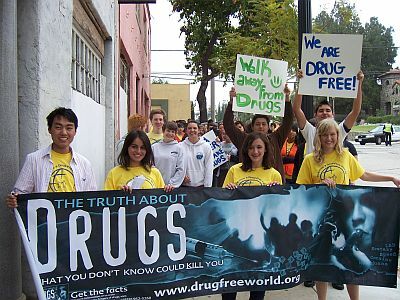 Sunland/Tujunga – Members of the Church of Scientology of Pasadena were among hundreds of youths who participated in an Anti-Drug March from Bolton Hall in Tujunga to Sunland Park. Supported by the Foundation for a Drug-Free World, students from the Verdugo Hills High School in Tujunga and the Delphi Academy in Lake View Terrace organized this walk and a festival to educate teenagers about the dangers of drugs. “We knew we wanted to do something to tell people about drugs, and at first we thought of just doing talks in different classes at school. That would be good, but we wanted to do something bigger, to help the whole community. That’s how we decided on the walk,” said Krista Baysdorpher from Delphi Academy. The statistics on drug use among youth is particularly alarming. From a survey done by the Foundation for a Drug-Free World, 50 percent of public school students in the United States have tried an illicit drug by the time they are 17 years old. To do something effective about this, the Foundation published booklets that provide information about the harmful and sometimes deadly consequences of the most popular drugs. During the recent anti-drug march, hundreds of these booklets were distributed, arming youth with the information they need to say “No” to drugs. The holiday season should be a time of joy. But for too many it is marred by antagonism, anxiety, even despair. So, is there a way to guarantee that the next few weeks will really be the “happy holidays” they sing about? And to help anyone get into the Christmas spirit? According to Adams, a cheerful or enthusiastic attitude toward life is something anyone can accomplish, not only for himself or herself but for friends and family as well. He was referring to a concept discovered by Scientology founder, L. Ron Hubbard — the A-R-C triangle. “A principal application of ARC is to increase affinity, reality and communication, and thus understanding, between oneself and another. How does one talk to somebody else? “The way to do this is to establish reality by finding something with which you and the other person agree. “Then you attempt to maintain as high an affinity level as possible by knowing there is something you can like about him. Adams also pointed out that fortunately, communication skill is something anyone can learn. And with it being a surefire route to a happier life, it’s certainly worth learning more about. For more information about how you can improve your communication ability and become more skilled at applying the A-R-C triangle, visit your local Scientology church or mission. The Church of Scientology International is encouraging parents to give their twens and teens a new kind of stocking stuffer this Holiday season-and its free. The Truth About Drugs packet contains a series of booklets on the most commonly abused drugs: alcohol, marijuana, inhalants, ecstasy, cocaine and crack cocaine, prescription drug abuse, methamphetamine, heroin and LSD. Nineteen year-old Nick Mauser, the Youth President of the Foundation for a Drug-Free World, the non-profit secular organization that publishes the booklets, says they debunk what kids hear on the street about drugs. ‘If you don’t know better, when someone tells you a drug will make you cool, help you forget your problems or make you one of the guys, it might seem worth the risk,’ said Mauser. ‘That’s why informative drug education is vital and why these booklets are straight talk-things that pushers and others who want you to do drugs don’t say,’ said Mauser. To get a free Truth About Drugs packet, contact your local Church of Scientology, or order them online at drugfreeworld.org. Scientology members in Malmö create their new Church! 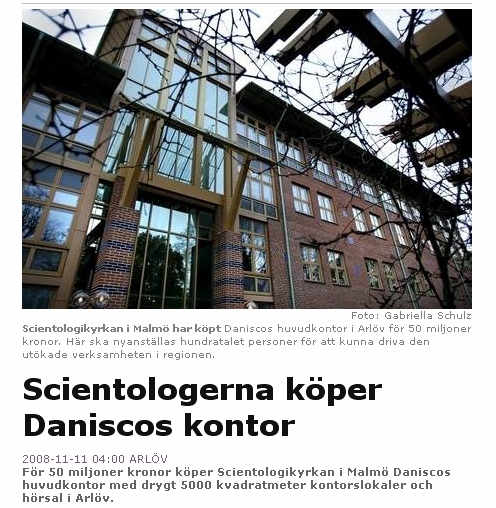 The Skanska Dagbladet reports today that the Church of Scientology in Malmo (“Scientologikyrkan i Malmö”) has bought a new building with more than 5,000 square meters space (53819 ft²). The sweetest part of all: it’s a former sugar company’s building, Danicos, and it’s production facility can be used as a huge event hall! Within days of the tsunami, Scientology Volunteer Ministers arrived in the region from all over the world to work with the search and rescue personnel and provide help to those who lost loved ones, homes and property. 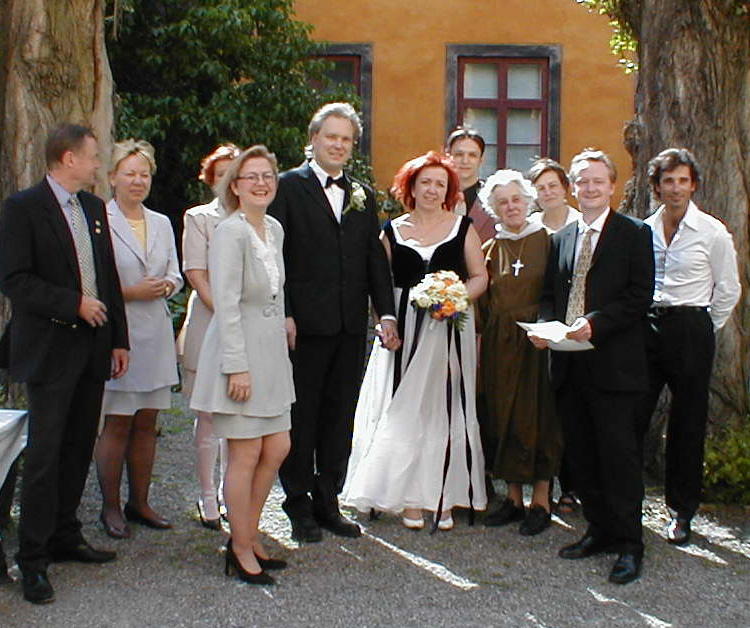 And when others returned home, a group of French Scientologists stayed on and made Pondicherry their new home and the full recovery of the region their mission. Towns and cities have emerged from the initial devastation, which, according to the Government of India, amounted to some $2.56 billion. Having completed the initial recovery phase, concentration has now moved on to “development”, and “Disaster Risk Reduction” (DDR) has become the primary concentration of aid to the area. High on the list of DDR priorities is establishing community-based programs that prepare local residents on how to survive in times of calamity. The Scientology Volunteer Ministers India Goodwill Tour arrived in Pondicherry in August to certify members of the Scientology Volunteer Ministers group and provide disaster preparedness training based on the Scientology Handbook. The members of this tour, who are experts in this technology, have already trained police, fire departments, health care and relief workers and volunteers throughout India. The defining characteristic of a disaster is disorganization and chaos, and the Scientology Volunteer Ministers courses on the basics of organizing and communication enable people to quickly set up new communication systems and infrastructure. They become skilled at restoring calm and getting people operating as a team to overcome the immediate threat from the environment. Once the initial panic of a disaster is over, those trained in this program can confidently take on the next order of business—the survivors themselves. They learn how to speed up recovery from injury. This unburdens otherwise overloaded medical resources who need to concentrate on life-threatening injuries. Those trained in Scientology Disaster Relief can also bring survivors through loss and trauma so they can get on with their lives, care for their families and participate in the relief effort themselves. What enables them to do this is the “Scientology Assist“. Developed by L. Ron Hubbard, founder of the Scientology religion, assists address the emotional and spiritual side of trauma, enabling the person to recover fully from injury, stress or shock. For more information on the program, disaster response training and Goodwill Tours, visit the Scientology Volunteer Ministers web site. With a population of 222 million, Indonesia is the fourth most populated country in the world. And if there were a competition for the most dangerous place to live, when it comes to natural disasters it would rank right up there at the top of the list. The December 2004 tsunami brought this fact home to the world. Anyone with a TV set or access to the Internet was engulfed by the images of the devastation: more than 170,000 dead in a matter of minutes; millions displaced from their homes; loss in property or possessions incalculable; an entire population affected by the loss. Within days of the disaster, hundreds of Scientology volunteers arrived in Medan, the capital of the province of North Sumatra. Led by an experienced team of Australian Scientology Volunteer Ministers, several hundred Scientologists from around the world formed into the Scientology Disaster Relief Team. First order of business—help the rescue workers, identify the bodies, deliver water, food and blankets to those who survived. With the most urgent and life-threatening needs attended to, the Scientology volunteers began concentrating on the service based on Scientology principles. These techniques have become the hallmark of the program—they helped those affected by the disaster recover from the effect of injury, trauma and loss, using techniques, developed by L. Ron Hubbard, called Scientology assists. They also trained doctors, nurses, Muslim clerics and family members, using the Scientology Handbook. They in turn brought help to survivors, and so touched the lives of hundreds of thousands in desperate need to help. When The Scientology Volunteer Ministers packed up and returned home, they left behind a team of local volunteers whom they trained and formed up into the Scientology Assist Team of Medan, Indonesia. So it was that in May 2006, when Yogyakarta was struck by a magnitude 6.3 earthquake, members of the the Medan Scientology Assist Team were already on hand when Scientologists from Australia, the United States and Europe flew in to help. The team provided urgently needed help in hospitals that were so overcrowded that parking structures had been turned into makeshift wards to care for those injured by the disaster. And again in July 2006 when Java was shaken by a magnitude 7.7 quake, once again the Scientologists trained thousands of Indonesians to deliver Scientology assists. By the end of August 2006 the Scientology volunteers trained more than 10,000 Indonesians who in turn have helped hundreds of thousands more. The legacy of the Scientology Volunteer Ministers continues to this day, with active members of the Scientology Disaster Relief Team on call throughout the country to help in times of need. For more information about Scientology, visit the Scientology Video Channel or the online version of the book What is Scientology?